Something has been brewing in the last two years and recently erupted in Michael Jackson Community and I do NOT believe that we are doing service to parties involved by sweeping everything under the rug as fans usually do. The following has to be said. Michael's Estate Executers had to release a statement about the kids being exploited! Katherine now exploits Michael's children in a “tribute”…we now attack Chris Hunt. It is NOT Oprah, it is NOT Howard Mann, It is NOT Chris Hunt…the fault really lies within Katherine Jackson who have milked her position as Michael Jackson’s mother far too long. And mark my words: we will continue to have OTHER Oprahs, Howard Manns and Chris Hunts as long as Katherine Jackson is alive or as long as she is condoned. Katherine isn’t a naïve old woman being used. It is all Katherine! If you think Katherine is being used by greedy businessmen because of her old age, you are naïve as Hell. Katherine has been sacrificing Michael’s wellbeing for the financial wellbeing of the entire Jackson clan since 1980s. Read about the Victory Tour; read about the arrangement she made with Segye Times who ended up suing Michael; read about her $1 million commission with AllGood Entertainment right before Michael died where her sole duty was to force Michael into a Family Show that Michael had said NO! Remember Joe Jackson blamed Katherine for Michael’s death? Well, he wasn’t all wrong. Leonard Rowe wrote a chapter, in his book, titled “The People That Could Have Saved Michael” He listed Katherine as number one. With her own admission, she knew Michael’s health was declining. Michael was melting in front of her mom. Katherine Jackson was the one person who had undeniable influence over Michael. She used this influence to make Michael do things he didn’t want to do just so that her less talented children could benefit financially by exploiting Michael Jackson brand. Remember May 15, 2009 meeting at Beverly Hills Hotel? Katherine and Joe wasn’t there to talk about Michael’s declining health that they were much were aware of, oh no, they were there to force him to do a Jackson Family Show. As Michael melted in front of his parents, all they could think was money….here we are two years after Michael died….all that Joe and Katherine could think of is still money! 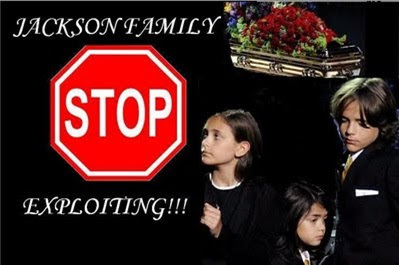 I blame Jacksons for Michael’s death just as much as I blame Conrad Murray. IF THERE WERE A REAL FAMILY TO MICHAEL, HE COULD HAVE A SHELTER TO RUN TO WHEN THE WORLD WEIGHED HEAVY ON HIS SHOULDERS! to support Michael, they were there to burden him. The man had his own financial issues and he was made to feel as if he had to take care of the entire Jackson clan. I very much blame Jacksons, especially Katherine for burdening Michael and not saving him. This is why I have no respect for her so-called grief that apparently only visible to a group of apologists but I have yet to see for myself. Michael’s death chanced many people lives. We are impacted too. We wake up with a hole in our chests too. I am tired of having to walk on eggshells because “Jacksons are grieving”. 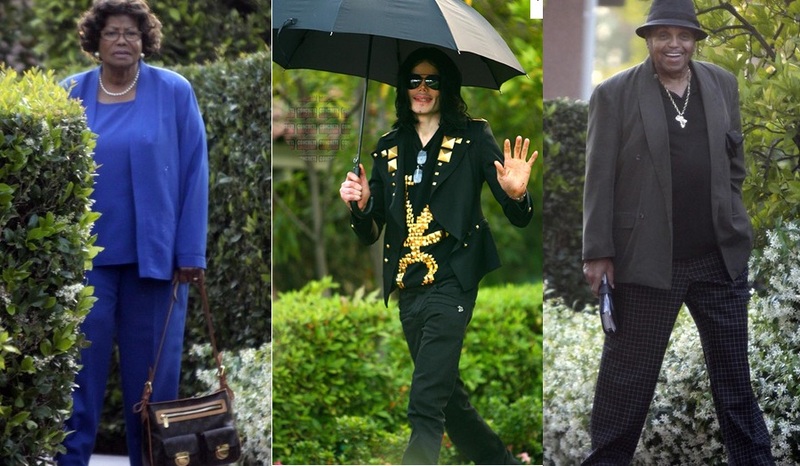 If they acted like a real family & extended Michael a lifeline, we wouldn’t need to grieve because he would be alive! Three days after Michael’s death, Joe Jackson started profiting from his son’s death. In light of public’s strong reactions to Joe, he realized that he needed a puppet….a puppet whom the public liked and respected to do HIS dirty deed. Enter Katherine Jackson. in itself for a mother to exploit her son's death but lately she exploits Michael’s children whom Michael went out of his way to shield from public eye. It seems Katherine has no respect for her son’s wishes as long as she makes money for the Jackson clan whose only talent has been to exploit Michael Jackson both in life and in death! When Katherine gets criticized for shamelessly exploiting her son’s death, then they play the “oh, she is 81, Michael loved her” emotional blackmail! If you KNOW she is 81, why use her to promote your crap? Promote your own crap so we can criticise YOU. It is not our fault that Jackson men hide under Katherine’s skirt! a career. What is Latoya and Reebie’s excuse not helping out Katherine in raising the million kids? Jacksons conveniently remember Katherine’s age only when it suits them. Taj became relevant recently…thanks to Michael Jackson fans whom he attacked because we believe that Michael’s children should be raised in congruent with his wishes and not be exploited. What Taj is REALLY mad at is that the fans are throwing a monkey wrench at a so-called “tribute” where he gets paid to pay respects to his uncle. Taj is just mad because the tickets aren’t selling like hot potatoes. The only time Taj ever speaks is about money. He could care less about what people say about his grandma. Taj said that he would protect Michael’s children the way Michael protected him and his siblings. Michael did NOT exploit Taj and his siblings so why is Taj and other future generations of Jackson kids exploiting Michael’s children? I'm concerned that the Family tradition has been passed onto the future generations and the new Jacksons will exploit Michael’s kids the way Michael was exploited. Just because you are a Jackson doesn’t necessarily mean you got talent and you should walk into Entertainment Industry. Go to school, get education, pursue a different path. Jackson 5 had talent, they were great…in the 1980s…they are in the past. Michael Jackson, the talented one, was meant to be a star and he worked very hard for his success. His legacy will outlive all of us so Jacksons shouldn't exploit Michael under the guise of “protecting his legacy”. YOU worry about your legacy. Michael’s legacy is fine. last name but I only respect people IF they are respect-worthy. There is NOTHING respect-worthy about exploiting a man's death and the his young children! One of the worst parts of dealing with Michael’s death was having to deal with Jacksons! “Well they are grieving”. Really? Show me one other Family whose grieving process involved exploiting the dead and his children. IT IS NOT GRIEF, IT IS GREED. Michael may have loved his mother but admit it, this was NOT how Katherine acted when he was alive. I know FOR SURE that, Michael often told his mother NOT to talk about him to media and she respected his wish while he was alive. I guess her loyalty expired on June 25, 2009. Where ever I turn in media, it is Katherine, dragging Michael’s children. And to think that she was appointed to GUARD those children. If Katherine Jackson doesn’t respect Michael’s wishes of privacy for his children then who will? a circus show under the guise of a “tribute”. What’s worse is that she inked Michael’s children into the tribute contract. This is the second occasion Katherine binded Michael’s children to a contract, the first was the contract with Howard Mann. Contracts are for adults, why is Katherine using small children, trusted into her care, as marketing tools? Jacksons not only don’t seek justice for Michael but they OBSTRUCT justice by their addict comments which landed them on Ed Chernoff’s witness list. Less than a month before Trial starts, Jermaine and Latoya promote their books, Katherine promotes a crappy “tribute”. We have wasted tremendeous amount of time and energy with Global Live Events but ADMIT IT it is NOT their fault. Didn't we have to start similar campaigns before Global Live Events entered the picture? We ALL know who is really at fault here: Joe, Katherine and Latoya are behind this “tribute”. And look at Jermaine. He said he wouldn’t promote his book but all he tweets about is his book. The thought of this Trial fills my heart with fears that Murray will get away. How can Jacksons even think about promoting crap, I will never understand. Why aren’t they advocating justice? Why aren’t they using their celebrity to seek justice? I am tired of having to turn a blind eye to their utter disrespect of Michael’s memory all because “they lost a family member”. Mine and other fans’ griefs are just as deep. Jacksons needs to stop pouring salt onto our wounds. Among everything fans have to worry about, we, at least, shouldn't have to worry about Michael's children. I am tired of being considerate of their feelings when they don't even care to LISTEN to our feelings. Any time you TRY to talk a Jackson...even cordially, they block you. We don't need Jacksons, Jacksons need us. We are the ones paying for their life styles. Michael was always loving & genuine with his fans. The only time Jackson$ remember fans is when they want us to buy their crap! Taj pretends that he is proactive in protecting his uncle’s legacy. Like I said, Michael's legacy doesn't need protection...especially from Jacksons! These are all just words to sway gullible fans. I NEVER saw Taj or any Jackson do anything useful for Michael. They get their names on papers owning fans' work as if they put in an ounce of effort! The list goes on and on and on We were there in Michael’s happy and sad times in life and we are still here protecting his and his children’s interests when he is gone. Fans have always remained loyal to Michael and we are the only ones who never betrayed Michael. So this CHILD to come on twitter, questioning OUR loyalty when we saw no loyalty whatsoever from THEM. Before Taj Jackson was conceived, we were fans and we still remain true and loyal to Michael and his children. The nerve Taj Jackson had and I blame some of you apologists out there enabling this kid to have an inflated sense of himself! I am positive that Michael loved his mother and he wouldn’t want Katherine criticized. But I don’t think he saw it coming that Katherine would act the wqy she has been acting in the last 2 years. I personally never knew Katherine was like this. She makes it SO HARD to support her. I would NEVER support or respect Katherine while she is dishonoring her own son and exploiting his children. No, Michael wouldn't like that his mother is criticised but how would he feel that his mother appointed his 3 young children as the new Jackson Family cashcows? If not Katherine, then who? Michael didn’t have a lot of people he could count on. At times, the unexpected stab in his back came from his own family members. He THOUGHT Katherine was somebody he could trust. So did we. Seeing Katherine dishonor Michael hurts deeply. The harsher our criticisms are, the deeper our disappointments. If Katherine dishonors Michael then how can we expect others to honor him? If she doesn't respect the privacy of the children then how can we ask media to? I’m sure what we are NOW realizing, Michael already knew when he was alive. Hence he spent his holidays either alone or with other families. And contrary to what they are conveniently claiming, Michael was NOT close with his Family. He distanced himself as far away from Jacksons as possible. After his death, it is so easy to understand why. to my stomach after walking in his moccasins only two years.